Fried Chicken Recipe with Honey Glazed - Chicken is popular food and there are lot of recipe on chicken today we are going to share something different about chicken recipe that is with glazed honey. Here is what you'll need to cook Honey-Glazed Fried Chicken for Servings: 4 peoples. 1. In a large glass bowl, combine water, vinegar, and salt, mixing until some salt is dissolved. Add chicken, cover, and refrigerate for 2-8 hours. 3. Remove chicken from brine, place in bowl and season. 4. In a medium bowl, combine eggs, milk, and hot sauce to create the egg wash. Add flour to bowl and set aside. 5. Transfer chicken to egg wash then the flour, coating evenly. 6. 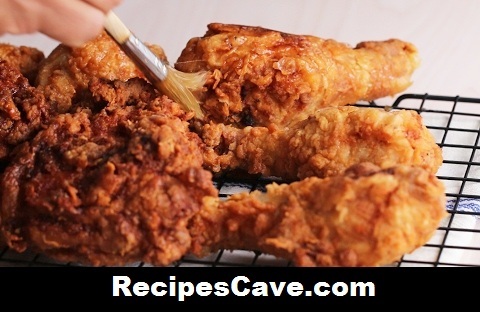 Fry chicken in a large cast-iron pan for 10-15 minutes on each side. 7. Place chicken on drying rack and let cool for 5 minutes. 8. Mix honey and water together and lightly brush each piece of chicken. your Fried Chicken Recipe with Honey Glazed is ready to taste.